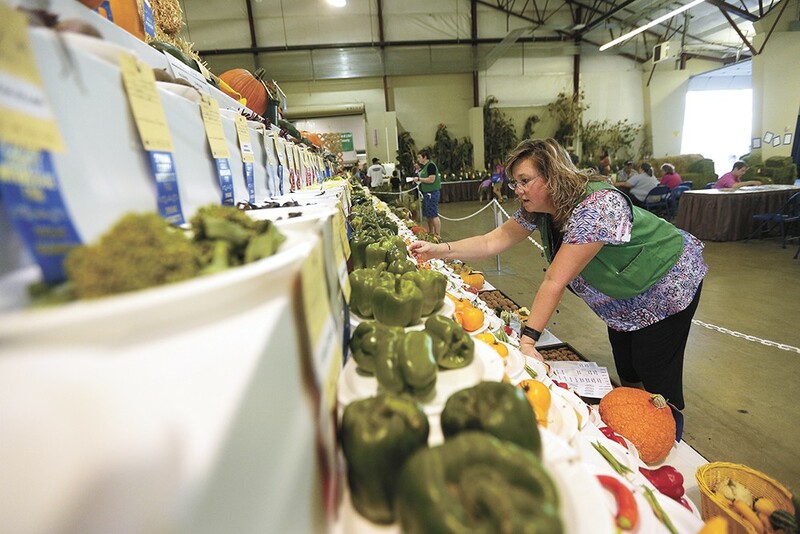 A rise in home gardening has boosted vegetable competition entries at the Spokane County Interstate Fair. Like a rite of passage to the end of summer, the county fair beckons with the promise of attractions like the rodeo, demolition derby, carnival rides and plenty of indulgent food treats. For some people, however, it's also about the opportunity to show off one's best homegrown output from the season in garden produce, livestock and even homemade items like beer and baked goods. This competitive side of the county fair can be an ongoing learning process for many aspiring brewmasters, bakers and beekeepers. "Don't expect it to be perfect or get the blue ribbon to start with," says Spokane County Interstate Fair home arts superintendent Louise Wells. Agriculture superintendent Bonnie Sewell concurs, adding that local fairs also provide learning opportunities for attendees. She recalls an older gentleman who grew giant pumpkins sharing his techniques for growing them — the Spokane County Interstate Fair's largest pumpkin on record exceeds 1,000 pounds — as well as how to carve them and use them in cooking. "Education is the biggest thing," says Sewell, a superintendent since 1997. "It's amazing how many people, adults and kids alike, don't know where their food comes from." The Spokane County Fair has 31 fair superintendents, who are tasked with supervising teams of people including the fair's judges, who review entries in animal exhibits — sheep, horses, cattle, pigeons, llamas, etc. — and "still" exhibits, such as flowers, photography, machinery and food, some of the latter of which must be taste-tested. Wells' four food judges in home arts — two each for adult and youth entries — have a sweet job. Literally. They'll taste upwards of 500 items, figures Wells, ranging from breads, cakes, pies, candies, cookies and two newer categories: sugar-free baked goods and gluten-free items, both of which require recipes to accompany entries. Although entries must be submitted in writing by Aug. 7, delivery of items and judging doesn't happen until just before the fair starts, this year on Friday, Sept. 7. It's a busy time, as both those working the fair and those hoping to become part of its blue-ribbon legacy bustle about. The fair employs the Danish judging system, which can yield more ribbons than just first, second or third place because entries are grouped and ranked according to a standard of quality (versus the American system, which compares all entries to each other). Judging can take up to two full days, depending on the popularity of the category. With 12 distinct classes of up to 15 lots in some cases, judging baking alone takes two days. Besides red, white or blue ribbons, judges may also award special recognition such as a "best of" category or the impressive-sounding Grand Champion and Reserve Grand Champion. When the doors open on Bay 3 for baked goods judging, some folks are already queued up. "Things can be hot from the oven still," says Wells, who seeks out people with both judging and baking experience who can understand the appropriate qualities of what they're judging. "Looks is part of it, and of course the flavor and presentation." Although her purview also deals with food, Sewell's judges do very little actual tasting. In the categories of eggs, cereals and forage, and fruits and vegetables, for example, judging is based on appearance, including the popular contest for largest produce. "One year I had a green bean that was 24 inches long," recalls Sewell, who personally enjoys Class 13 of the horticulture category: largest vegetables. Ten pounds, for example, is the minimum requirement for cabbages and zucchini squash. Horticulture in general, says Sewell, is one of the largest entry categories, suggesting that home gardening is on the rise. Entries by adults have nearly tripled since 2006, the last year for which data is posted. Another large category is food preservation, which Sewell says garners a lot of interest and appears to be making a comeback. Beer and wine have made steady gains in popularity, too. The judges of those, says Sewell, provide specific feedback to amateur brewers, which is invaluable in helping them improve their craft. Amateur brewers compete across 19 brackets, from bitters to lagers and Belgians, while winemaker entries are less conventional. Wine covers varieties made from berries and stone fruit, but also flower petals and vegetables like beets and carrots. "Some of the things they put together you'd think would be atrocious, but they're not," says Sewell, who is appreciative of applicants' creativity. Both the beer and wine categories this year includes a subset for commercial producers, as well as one for homemade soda, the only category available to youth. This is just one example of how superintendents like to change things up, says Sewell, noting that displays and entry categories continue evolving based on participant and attendee feedback, not just for popular food trends but for the fair itself, which has evolved as a reflection of social and commercial issues shaping the region at the time. In 1896, for example, the Spokane Fruit Fair, as it was called at the time, mirrored the region's reign as a fruit-forward center of commerce — chiefly apples — yet, the inclusion of mineral exhibits helped nudge organizers to rename the fair in 1899 to the Spokane Industrial Exposition. In 1901, the name was changed to Spokane Interstate Fair, eventually becoming today's Spokane County Interstate Fair. By and large, fair entry categories vary only slightly across geographical borders and time. In Kootenai County, where the North Idaho State Fair recently concluded, culinary arts entries were similar to Spokane's: food preservation/canning, baked goods, decorated cakes/cupcakes and homemade spirits, which in Idaho allows for wine, beer and liqueur. According to the International Association of Fairs & Expos, fairs have long been integral to American history and culture. The oldest in North America, held in Nova Scotia, dates back to 1765 and is an event that continues today. Fairs now number around 2,000 nationwide, and continue to be a mixture of commercial showcases, entertainment, socialization and learning. The original print version of this article was headlined "More Than Fair"